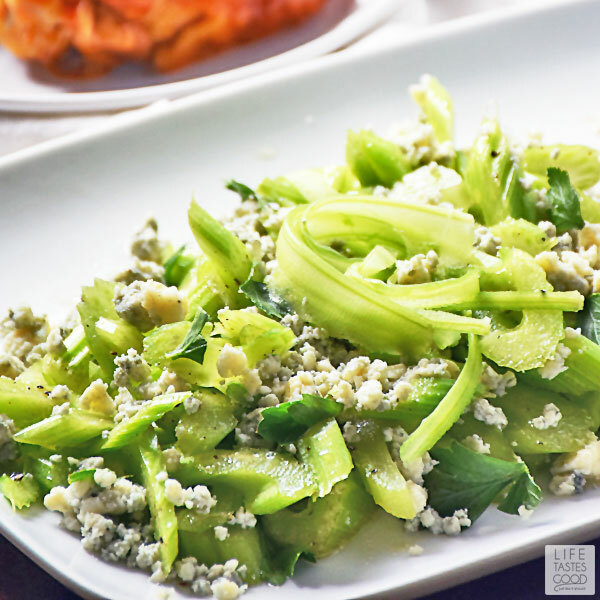 Crisp, refreshing Celery Salad with Gorgonzola (Italian Blue Cheese) is a light and crunchy salad recipe that is super easy to prepare. It's a delicious, low carb salad to start a meal or pair as a side dish with your favorite buffalo chicken recipe. You can't go wrong with celery, blue cheese, and buffalo chicken. It's a classic! 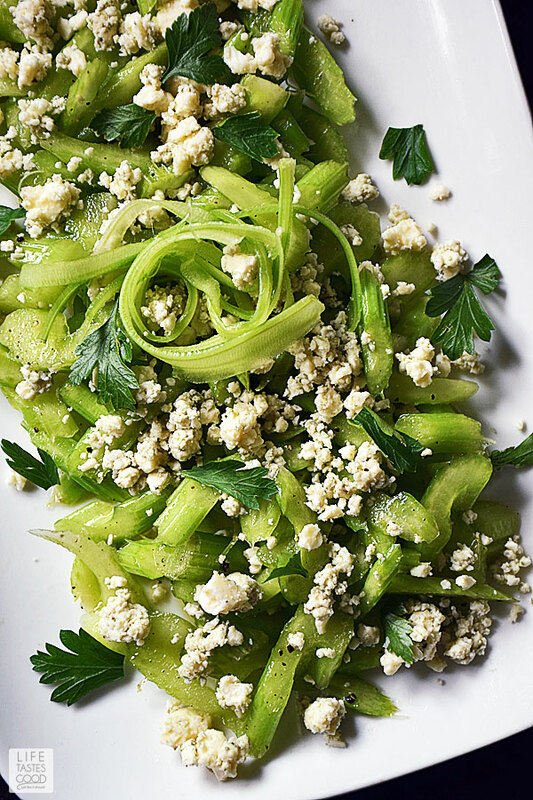 It sounds a little odd to use celery as a main salad ingredient, but Celery Salads are actually quite common in Italy. So, when I needed a side dish to pair with a new recipe I was developing for Baked Buffalo Chicken Thighs, I thought Celery Salad would be perfect! What pairs better with buffalo chicken than celery and blue cheese? I can't think of anything. This celery salad would also pair nicely with my Grilled Buffalo Chicken Sandwich Recipe and my Buffalo Chicken Empanadas. These flavors pair together so perfectly, people everywhere enjoy this flavor combo traditionally as a favorite appetizer. As a matter-of-fact, one of our favorite appetizer recipes is my Low Carb Buffalo Wings with Gorgonzola Sauce. The Gorgonzola sauce is TO DIE FOR! I am not kidding you! It's a must-try! Because we are so obsessed with this flavor combo, it just made sense to me to toss together a simple Celery Salad to pair with my buffalo chicken thighs for dinner, and I'm happy to report, it is a WINNER. We love it so much, I just HAD to share it with you! Celery salad is so easy to make. Seriously, it really doesn't get much easier. 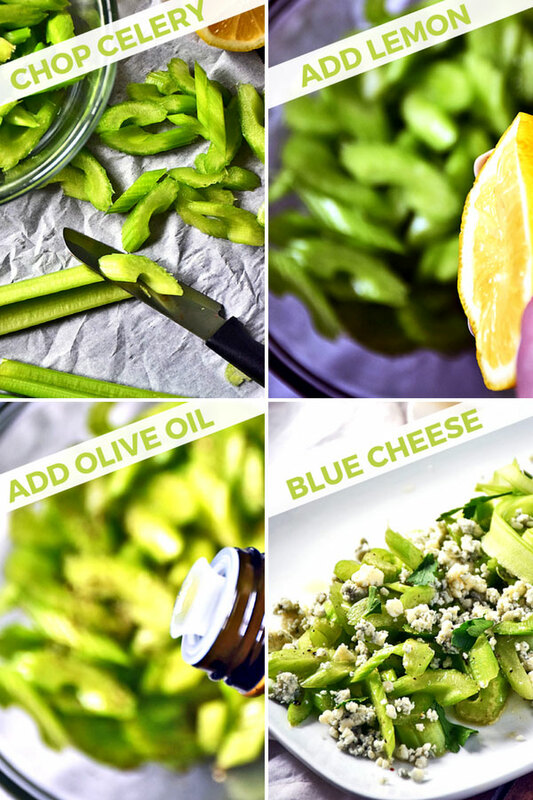 This simple celery salad recipe has just 4 ingredients and takes mere minutes to prepare. It’s basically sliced celery, olive oil, juice from a lemon, and salt & pepper all tossed together and then topped with crumbled blue cheese. 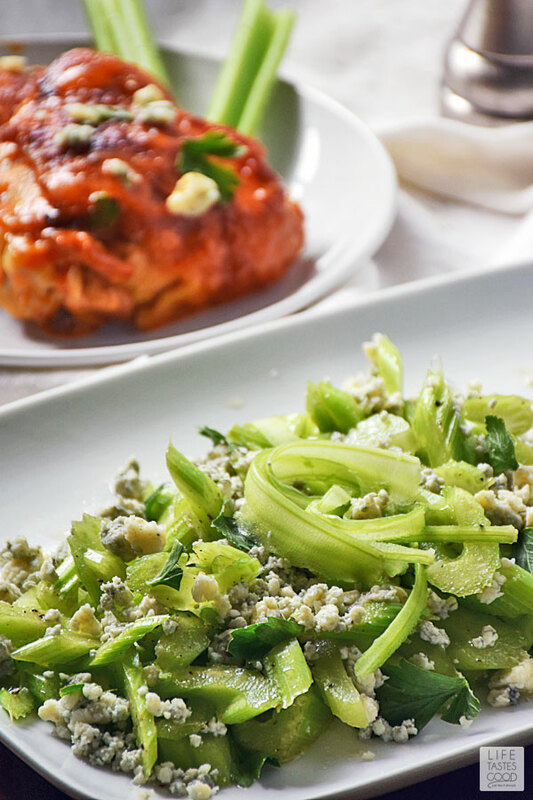 Crisp, refreshing Celery Salad with Gorgonzola (Italian Blue Cheese) is light and crunchy. It's a delicious, low carb salad to start a meal or pair this as a side dish to your favorite buffalo chicken recipe. In a mixing bowl, toss 2 cups sliced celery with 1 tablespoon fresh lemon juice, 1/2 tablespoon olive oil, and salt and pepper to taste. Arrange on a serving platter and top with 1/2 cup Gorgonzola cheese. Give it a taste and adjust the seasoning to your liking. Serve with additional Gorgonzola cheese on the side. Ya know, I never thought of making a salad as celery for the main ingredient. This is genius! That lemon juice is gonna make it taste bright and fresh, and Gorgonzola is one of my favorite cheeses! How can you go wrong?! Thanks for this Marion!